For the 2nd time in just over a year, we decided to hit the pause button. The first time, when the idea of this trip arose, was almost this exact same time last year. Currently, this is our first intentional extended stay in any one place (all others having been determined by mechanical problems). After we saw how beautiful it is here, we looked at each other and said we didn’t want to leave. Frankly, the showers are what did it for me. They’re great – similar to a spa. After showering in all kinds of places, including the southern backwoods marina where I told Matt we could easily disappear and never be heard from again (“close the bathroom doors or the raccoons get in” we were told) having plush towels and toiletries provided is a luxury I wasn’t ready to give it up. For Matt, it was March Madness (i.e., college basketball season). The lounge has a TV and after 12 years without one, he is in heaven being able to watch as many games as he wants. Walking from the bathrooms back to the boat alone one night, I was standing on the dock savoring this sensation. That we chose to stop. It felt great – and healthy to listen to that inner voice. To wave the white flag and say we need rest. Why is this so hard for us as adults? It’s easy for kids. I remember one long day of sailing. 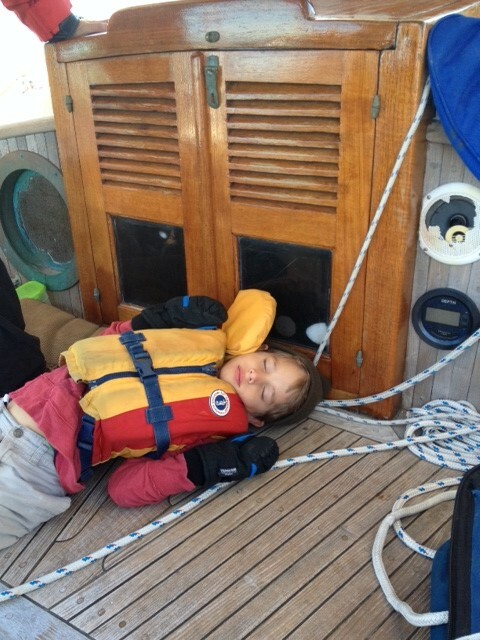 We had eaten lunch on the deck and then Joshua simply lay down where he had been sitting and went to sleep. For the next two hours, we stepped over him as needed to go down into the cabin. As adults, it’s too easy to refuel with caffeine and sugar. Why is it so hard to admit we are tired and need a break? This entry was posted in Uncategorized on April 5, 2014 by Diane.